The T. Rowe Price Media and Telecommunications fund seeks long-term capital growth. This TRP fund generally invests most of net assets (>80%) in the companies’ common stocks engaged in any media and telecommunications sectors such as the Internet, publishing, movies, cable/satellite TV, telephones, cellular services, and technology and equipment. This PRMTX fund typically invests in companies in the large- to mid-capitalization range. Daniel Martino has managed this best sector equity fund since October, 2009. This T Rowe Price fund was first introduced to the public in October 1993. The annual expense ratio of this fund is 0.84%. The amount of this expense ratio is lower than the category average (1.65%). As part of no load fund, this fund has no management fee and no front-end sales load fee. This fund has a yield of 0.53%. The last dividend distributed was $0.50 in December 2009. This fund’s total net assets are $2.15 billion. 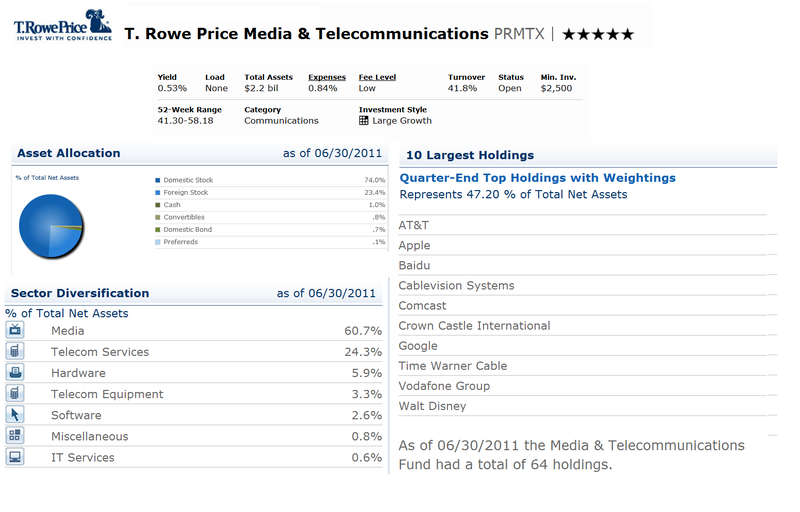 As the best rated fund, this PRMTX fund has gotten 5-stars rating from Morningstar. It is also on the top of the US News best funds in communication category. It has 8.47% of YTD return with the best 1-year total return in 1999 with 93.09%. It has returned 41.96% over the past one year and 11.66% over the past ten years. This fund has recorded 12 years positive return achievement and 5 years with negative achievement. The minimum balance to invest in brokerage account for this fund is $2,500 with $100 minimum subsequent investment. While for IRA account, the minimum initial investment is $1,000 with $50 minimum subsequent investment. PRMTX fund can be purchased from 83 brokerages include T Rowe Price, E Trade Financial, Vanguard, JP Morgan, Fidelity Retail Funds Network, Td Ameritrade, Schwab Retail, Mony Securities Corp, Trustlynx, Sun Life CPS, etc. This fund is not available in any other class. And it is currently open to new retail investors. As of June 2011, the top 6 asset allocations of this T Rowe Price fund are 74.0% in domestic stocks, 23.4% in foreign stock, 1.0% in cash, 0.8% in convertibles, 0.7% in domestic bond and 0.1% in preferred. This fund had a total of 64 holdings as of June 2011. The top 10 stock holdings are AT&T, Apple, Baidu, Cablevision Systems, Comcast, Crown Castle International, Google, Time Warner Cable, Vodafone Group and Walt Disney. These ten holdings represent 47.20% of total net assets. The top sector diversifications are Media (60.7%), Telecom Services (24.3%), Hardware (5.9%), Telecom Equipment (3.3%), Software (2.6%), Miscellaneous (0.8%) and IT Services (0.6%).